This entry was posted in Articles and tagged 718.112(2)(b)(1), 720.306(1)(a), condo, condo association, condominium, condominium association, hoa, homeowners association, quorum. ← Rent Your Condo…I Don’t Think So! For a HOA in Florida: If a homeowner is delinquent does that lower the “total voting interest”? … as that homeowner can’t vote. 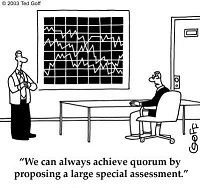 EXAMPLE: The quorum percentage for my HOA Is 30% with 100 units. So the quorum number should normally be 30 members. If there are 5 homeowners delinquent does that lower the quorum number to 29(95x.3 = 28.5) or does it stay at 30? It would go to 29 as you have suggested. Can the board make a decision to go ahead with the quorum as the number is only 0.4 short which equates to approx 3 owners. This is the closest we have been to being able to have an elected board for several years and would hate to lose the chance due to a very small number.